In the process of working on Take Control of Thanksgiving Dinner, I mentioned the items you’ll have to remove from the inside of your fresh or frozen turkey: the neck and the giblets (heart, gizzard, and liver). These parts aren’t usually eaten, but they can be used to make an excellent gravy. I wanted to make the point that I recommend leaving out the liver, which might add undesirable flavors to the gravy, but in order to explain to the uninitiated which one of these weird tissue masses was the liver, I had to give a verbal description of the size, shape, and color of each item that constitutes the giblets. Upon reading my description, the publisher felt that a picture would serve better, and I agreed, so I snapped a shot of the neck and giblets sitting on my cutting board the next time I roasted a turkey. Now granted, if you’re not used to mucking around with animal insides, this sort of thing might strike you as kind of gross. But I was unprepared for the strong “yuck” reaction I got from my editor and publisher. Although they were both seasoned cooks and had dealt with these things personally numerous times, they thought the picture was somehow just too graphic and unappetizing to include in the book. My view was that if you’re going to see it and touch it in real life, it shouldn’t be a big deal to see a picture—but I was overruled, and we had a drawing made instead. However, I did include a link to this post, wherein I’m pleased to present the full-size, not-for-the-queasy photo of the giblets (click the thumbnail to see the larger image). 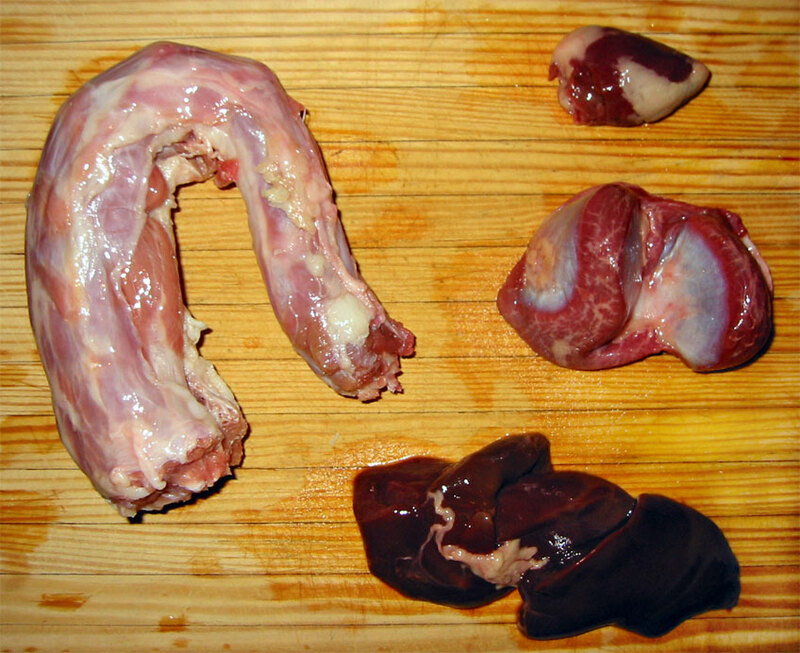 That’s the neck on the left, of course; on the right, from top to bottom, are the heart, gizzard, and liver. Obviously, the exact appearance (and size) of these items will depend on what sort of turkey you buy and how it’s butchered. But this should give you a pretty good idea of what you’re looking for. Whatever else you do, be sure to check both cavities (the large one at the tail end and the small one at the neck end) for these items—often found in plastic bags—and remove them before cooking the turkey! Joe, thanks for the photo that identifies the turkey innards. Finally, some practical info for us cooks that are trying to learn more. Kudos !! Thank you for the picture. What on earth did we do before the Internet? Much appreciated! Thanks for the “graphic” photo. I couldn’t remember what was what and a drawing would have been useless! 6 years after you posted this–thank you! Last year, we guessed at which was which, and judging from your picture, we guessed wrong. Thank you for posting this with a photograph! Seeing the pic makes it easier to deal with the real thing, too. Thank you for clearing this up for me so I dont have to call the in-laws again this year. But, what will they have to laugh about as we sit around the table? Just got my bird in it’s brine and after retrieving the packages decided to find out what exactly I have been using for my gravy for years. Funny thing is, I recognized the liver but had NO IDEA what the other stuff was! LOL Been using in the broth for years. (Never chppoed them up, though) Now, I’m a little skived out! Oh well, it’s all in a day’s cooking. Thanks for the pics. Happy Thanksgiving! Thank you Joe for the very helpful photo! Believe it or not I’m a vegetarian but since I’m married to a meat eater & have long since given up on converting him, I at least try to see that the meat he consumes is more natural (i.e., organic, humanely raised and including the “nasty bits” – like our ancestors intended). Before my veg days I grew up eating giblet gravy, so last year I cooked up everything in the bag and chopped it into gravy. I had no idea the liver should not be included and my hubby had no complaints. Just in case though, this year I’ll leave it out of the gravy but fry it up for the dog’s dinner (she’ll be in heaven). Thanks again! Almost forgot…my giblet bag definitely contained some extra bits: a pair of organs that were larger than the heart and smaller than the gizzard. I’m guessing these are kidneys? Oh well, they’re going into the gravy.